A fellow classmate didn’t say this about my pants — but about my everyday carry bag. We were a few hours into our Active Shooter Force on Force class held by QSI Training. The zippers on my inexpensive sling bag had come unzipped about 2″. I use this bag for my KPOS NFA Glock enclosure, and the opening was large enough to see the firearm inside. My very well made Adidas Rydell bag also suffers from zipper creep. However, because the zippers are of good quality the travel is only about 1/4″. Still, exposing yourself in public isn’t something Shepherds do. Always check your zipper when you sling your bag. When you start carrying an SBR or a PDW you learn all sorts of things. You have to be aware of your barrel printing, or how the firearm is oriented in relation to how the bag opens, or the firearm rubbing against your bag and causing an outline. 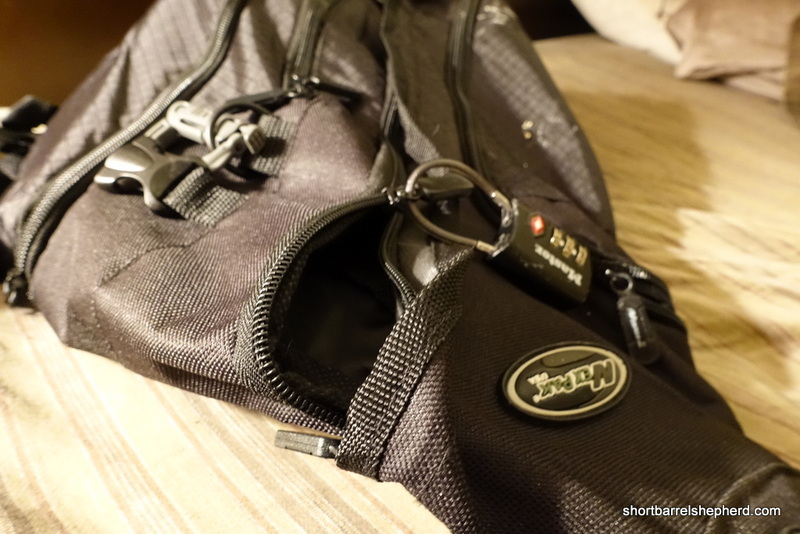 You may decide to lock your zippers together for when you are away from your bag. If you do, be aware the added weight of a lock may encourage zipper travel. One way around this is to put the lock on the “top” zipper, but that may cause a problem when you are trying to unzip the bag under duress. During training or practice, I find that the grab the lock and use it as a zipper pull. If your lock is on the top zipper you may wind up “zipping” your bag shut when you mean to open it. I figured I was done learning about keeping my zipper closed when I was 4. When you start EDC, there’s a whole host of little things you have to relearn.